First, I have to say that I adore reading nonfiction. Question number 5 is put in such a way that makes that seem almost impossible. That isn't the case for this nerdy girl. I recently finished the following book and enjoyed it immensely. In the last days of old Peking, where anything goes, can a murderer escape justice? Peking in 1937 is a heady mix of privilege and scandal, opulence and opium dens, rumors and superstition. The Japanese are encircling the city, and the discovery of Pamela Werner's body sends a shiver through already nervous Peking. Is it the work of a madman? One of the ruthless Japanese soldiers now surrounding the city? Or perhaps the dreaded fox spirits? 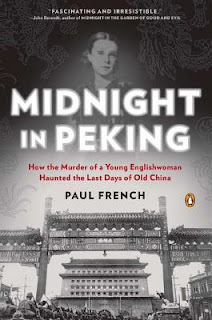 With the suspect list growing and clues sparse, two detectives—one British and one Chinese—race against the clock to solve the crime before the Japanese invade and Peking as they know it is gone forever. Can they find the killer in time, before the Japanese invade? I don't read a ton of nonfic, but when I do, I've really enjoyed it. I've read a lot about this one, and I need to pick it up. It's a good one, I hope you find time for it! This really looks good. It seems to cover an "small" incident that happened in a very momentous time. I think that one can learn a lot from such books. I too wonder at the premise of the question as I love non - fiction. I know folks who read nothing else. I think if I had to read nonfiction exclusively I'd be very happy :) I think it's because I love facts so much, there's nothing better than learning right? I keep meaning to pick this one up. It looks like it's right up my alley! Marie, if you do I'd love to hear what you think of it! I enjoy memoir/NF. I haven't heard of this one before, sounds interesting. Every time I pause long enough to read a non fiction... what do you know.... I enjoy it!